+Eurovision Logo for 2009. The Best Yet? This Year’s Eurovision logo uses the usual generic design as the official identity complete with Russian flag. The interesting design this year comes from the sub logo, a “fantasy bird” which takes full advantage of color. It comes from Red Square Productions, a company the host Television Channel One recruited to take care of the contest’s graphics. It is definitely the most interesting sub logo yet and comes after last years interesting design from Serbia which some might say raised the bar a little. Like Serbia’s Confluence of sound logo the Russian design takes its origins from its host Country. The Serbian logo was based upon the Confluence of two rivers meeting in Belgrade, a convenient confluence of sound. 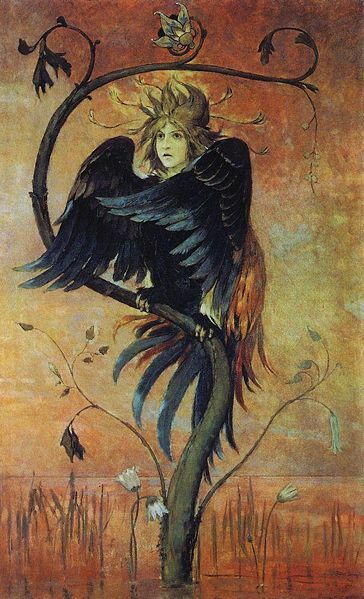 The new Russian “fantasy bird” logo could be a reference to Russian folklore and the stories of prophetic bird people such as Gamayun, Alkonost and Sirin. The logo has been widely distributed already and is fast becoming a hit amongst fans. It can be applied on various colors and surfaces both in parts or in complete form. It will of course be seen during the Eurovision Song Contest this year as well as on the official website and various other associated media. One definitely to watch out for! Eurovision Song Contest Sub Logo for Russia 2009. Prophetic Bird Gamaun from Russian folklore. Eurovision Song Contest Sub Logo for 2008, Serbia.